Beyond books, the Box of Books offers many services. The Box of Books offers one on one training, technology classes, access to devices, and more with our Technology Services. 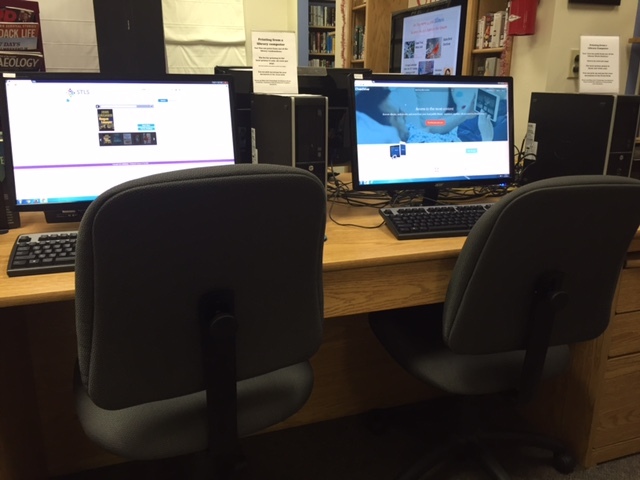 We have 2 lab computers, 2 laptop computers, Kindle, Nook and iPad available to patrons. We have a scanner for scanning documents and photos. With your library card, you have FREE access to books, DVDs, audiobooks, large print materials, eBooks, magazines, digital audio books, and more! As part of the Southern Tier Library System, Box of Books users have access to 48 regional libraries! StarCat allows you to browse library collections and access your account to put holds on items, renew materials and more. Check out Overdrive for access to hundreds of digital audiobooks, eBooks, and movies/TV shows. We can help you put these on your mobile device. RB Digital (formerly Zinio) gives library users access to online magazines on your computer or mobile devices. Have (free) access to music and more using Freegal. We can show you how to use these on your devices.